Artist Robert Graham recruits Scansite and AP Proto to help him create a new bronze sculpture for the Basilica at Notre Dame University. The additive fabrication process known as Selective Laser Sintering (SLS®) is best known for producing tough, durable parts for rigorous testing and wax patterns for investment casting direct from 3D Computer Aided Design (CAD) data. SLS® has long been a favorite of many designers and engineers and has now found a new proponent in contemporary artist Robert Graham. Historically, Graham has used traditional methods for producing his cast artwork but those methods are known for being slow, laborious and usually result in a loss of some artistic detail. Graham, being the progressive artist that he is, was already using other additive fabrication methods for previous projects and was introduced to the benefits of SLS® technology during his extensive relationship with American Precision Prototyping (APP). Graham was commissioned by the University of Notre Dame to create a 6 foot, full body bronze statue of Father Basile Antoine-Marie Moreau, c.s.c for the Basilica of the Sacred Heart Church at the University. Graham, equipped with the knowledge of a new and improved technology, was faced with the challenge of pursuing this project with traditional methods or with this new additive fabrication process that would not only shorten the project time but would also yield a truer representation of his original sculpture. Mr. Robert Graham, world renowned Venice, CA artist and sculptor has been creating magnificent works of art since the mid 1960’s. His works have been featured in the Museum of Modern Art in New York City, Museum of Modern Art in Paris, France, Museum of Contemporary Art in Los Angeles and many other galleries and museums around the world. 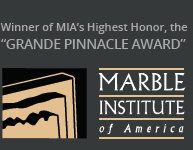 In addition to museum and gallery artwork, Graham has designed, sculpted and created civic monuments, awards and coins, public and private works and has consulted on several architectural projects. Graham, also known for his bas-relief pieces, sculpted the Franklin D. Roosevelt Memorial in Washington, D.C., the Duke Ellington Monument in Central Park in New York City and the Olympic Gateway at the Los Angeles Memorial Coliseum for the 1984 Olympic Games. Graham’s previous public works were monumental cast pieces and were created with the traditional method of enlargement and casting. Typically, traditional methods begin with a hand sketch of the piece followed by the creation of a maquette which is a smaller, sculpted model. 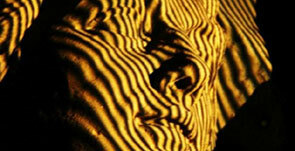 The maquette is then taken and enlarged in clay using manual dimension transfer techniques. This step in the process is expensive, time consuming and typically the artistic detail in the maquette is lost in translation when the larger sculpture is completed. 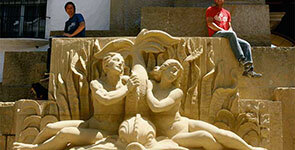 Once the large sculpture has been created to the enduse, desired size, it is then cut into smaller, manageable sections. Those smaller sections are then taken and used to create latex rubber and plater molds from which wax patterns will be produced. Once the wax sections have been molded, they are then taken to the foundry and cast into bronze. Once the parts have been cast into metal they are assembled, welded and a finish patina applied. Graham had utilized additive fabrication, specifically SLS®, SLA® and Polyjet in the past for smaller statues and wall panels that required no secondary finishing or processes. 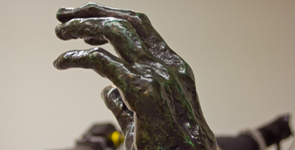 However, this project was unique because the piece was exceptionally large and had to be cast in bronze. This statue, with its intricate detail and size was a challenge not only for APP but also for Graham. All parties involved were on a tight schedule which left no room for error in any phase of the project. 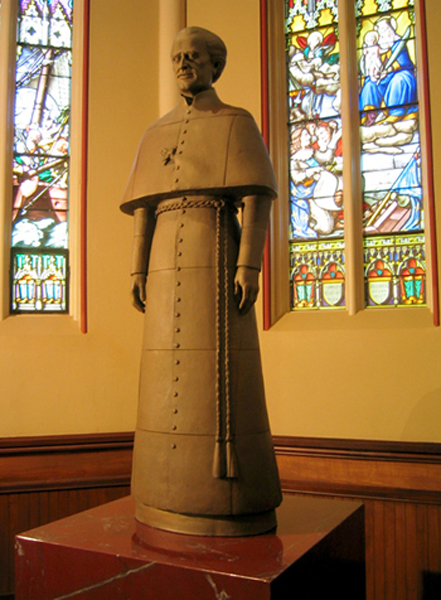 The University of Notre Dame commissioned Graham to create the statue of Father Moreau in honor of his beatification. Beatification is a process by which a person is granted the title of Blessed by the Holy Father declaring that person a model for Christian life and virtue and is a step towards Canonization or being declared a Saint. This title is only given after an exhaustive study into their life, work and practice of virtue. The original ceremony for Father Moreau was held in Le Mans, France on Saturday, September 15th, 2007. Among the 4000 plus in attendance were the Prime Minister of France and his wife. The statue, required for the ceremony at Notre Dame, was held on Thursday, September 20th. In attendance at Notre Dame were members of the Holy Cross community, the Bishop of Bangladesh, the archbishop of Los Angeles, University President Father John Jenkins and university attendees. In his quest to keep all aspects of the original sketch true, Graham decided to use the 3D scanning method combined with additive fabrication and direct digital manufacturing to have his statue created. 3D scanning is a faster, more cost effective path from the maquette to the final bronze. This process also allows for retention of the original artistic detail of the handsculpted maquette, reduces time to casting and ensures the model size is accurate. Graham contacted Scansite, located in Woodacre, California to perform the 3D scanning and data collection. 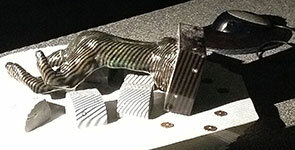 Scansite, an industry leader in 3D scanning, had worked with Graham on several projects in the past. Scansite used an ATOS structured light scanner to collect three dimensional data from the physical object. The surface data of the object is captured to create a dense collection of X, Y and Z points in 3D space. This point cloud can easily be exported to polygonal 3D CAD file that can be used in additive fabrication and direct digital manufacturing. The digitizing source of the ATOS scanner is a halogen bulb which gathers 1.4 million points per second which produces a much cleaner, higher resolution file. Once APP received the scanned file, it was hollowed to facilitate the casting process which requires a wall thickness of approximately .125”. After hollowing, the file was cut into manageable sections which were then cut into smaller segments that were of an appropriate size to fit into the SLS machine. Each segment had to be scaled to account for differential shrinkage that occurs during the additive fabrication and foundry processes. Flanges and bolt holes were designed into the 3D CAD file to facilitate casting and assembly. After the sections were adequately designed for manufacturing, APP was ready to begin building. Since this was to be a master pattern for metal casting, APP chose to use the SLS® process and 3D Systems’ CastForm™ PS powder to build each segment. CastForm™ powder, with its low density and low ash content, was formulated specifically for the investment casting process and is a favorite among foundries across the country. The 3D Systems Sinterstation® HiQ™ HS was the machine selected for this project. The HiQ HS has a large build envelope of 15x13x18” and a high-powered laser to facilitate faster builds. Eight builds were scheduled to complete the 28 segments that made up the complete statue which would take approximately eleven days of machine time to complete. Each build, holding 3 to 5 segments required an average of 32 hours each. After each build was finished, the parts were required to cool in the machine for several hours before part removal could begin. Once the parts had cooled, they were carefully removed from the bed of powder and cleaned off to remove excess powder with brushes and delicate tools. Once each piece was completely free of excess powder, it was hand dipped into hot, melted foundry wax for a specific amount of time which was dependent on each segment’s thickness. The part was then removed and allowed to drain and cool. After additional hand work, the segments were complete and ready to be packaged and sent to the foundry. Wax patterns that are created using additive fabrication can typically be processed at the foundry with the same methods as wax patterns created using traditional methods. The foundry takes the CastForm™ pattern and coats it with several layers of ceramic slurry to form a ceramic shell around the part. Once that shell is hardened, it is put into an autoclave to burn out the CastForm™ wax pattern leaving an empty mold. The empty mold is then placed into a furnace at a temperature of approximately 2000 degrees Fahrenheit to cure. After the mold has cured, additional cleaning is performed to remove any remaining CastForm™ material, ash or other debris. This step is crucial to the success of the cast bronze because any imperfections will result in a bad pour and would destroy the detail of the final cast piece. Molten bronze is then poured into the cleaned ceramic molds creating the cast part. After a cooling period, the ceramic shells are removed via a break-out process. Sprues, gates and runners in the casting must be ground off and the part cleaned up and inspected for any porosity, short feeds or other defects. Segments are assembled into sections and sections are assembled to form the complete statue. One of the last steps in the casting process is to apply a finish patina which gives the casting a uniform finish. The Notre Dame project was ultimately a success. The benefits of additive fabrication and direct digital manufacturing reduced project time, lowered cost and produced the original artistic detail in the bronze. Robert Graham continues to work with APP on new projects and will continue to utilize additive fabrication and direct digital manufacturing on future projects.